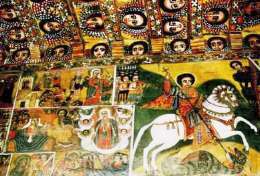 Ethiopia has a district history and infinitely varied culture dating back to ancient time. The Axumite kingdom in the north, extended to Arabia and was a great power along with Persia, China and Rome. Coins were issued, trading reached India and China, great edifices and dams were erected and scientific and philosophical works were translated into Ge'ez, one of the earliest written languages. Christianity became the state religion in 330 AD and the Orthodox Church represents the oldest unbroken Christian church tradition in the world.Even older are the religious traditions of the Ethiopian Jews, Bait Israel or Felasha, which go back to King Solomon and the First Temple. The very first Moslems, fleeing persecution in Mecca, sought and were granted refuge in Ethiopia. The music springs from this heritage and some of the instruments have been traced back 3000 years or more, appearing in the paintings and descriptions on the walls of Egyptian tombs and temples. In recent times there has been dramtic change. 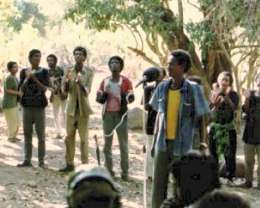 At the time these recordings were being made Ethiopia was moving from military dictatorship to fledgling democracy. These events, like those of the past, influenced the musical and cultural traditions of the whole country. Recorded by Lesley Larkum during her seven month stay in the country. The selections reflect the ethnic diversity to be found in Northern Ethiopia and covers a wide cross section of music making between February and June 1991, in the province of Tigray. Included are Tigrinya songs, the language of the majority in Tigray, songs of the Kunama and Agew nationalities, Ge'ez the ancient language of Ethiopia used by the Ethiopian Orthodox church, Arabic used by Moslems during prayer and a song in Amharic. There are songs reflecting events of the time like "Goonah", "Asserte Hade Leyekateet" and "Teba'at Bitsot" which talk of the struggles and courage of the people fighting the Derg regime. Then there are traditional songs such as "Ane Keharas", "Kilitte Shigurti" and "Agarame". Much of the daily life of the people continued seemingly unaffected by the war, as reflected by the music of the Christian Church and the Moslem ceremony.